The Direct Lookup Table (n-D) block indexes into an n-dimensional table to retrieve an element, vector, or 2-D matrix. The first selection index corresponds to the top (or left) input port. You can choose to provide the table data as an input to the block, or define the table data on the block dialog box. The number of input ports and the size of the output depend on the number of table dimensions and the output slice you select. If you select a vector from a 2-D table, the output vector can be a column or a row, depending on the model configuration parameter setting Math and Data Types > Use algorithms optimized for row-major array layout. The block inputs are zero-based indices (for more information, see the Inputs select this object from table parameter. The Direct Lookup Table block supports symbolic dimensions. 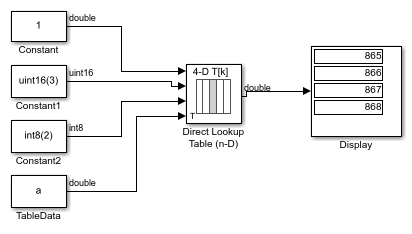 The Direct Lookup Table (n-D) block uses inputs as zero-based indices into an n-dimensional table. The number of inputs varies with the shape of the output: an element, vector, or 2-D matrix. You define a set of output values as the Table data parameter. For the default column-major algorithm behavior, the first input specifies the zero-based index to the table dimension that is one higher than the output dimensionality. The next input specifies the zero-based index to the next table dimension, and so on. Suppose that you want to select a vector of values from a 4-D table. The following mapping of block input port to table dimension applies. Depending on parameters you set, the block icon changes appearance. For table dimensions higher than 4, the icon matches the 4-D version but shows the exact number of dimensions at the top. When you use the Table data parameter, you see these icons for the default column-major behavior. Some icons are different when you select the configuration parameter Math and Data Types > Use algorithms optimized for row-major array layout. When you use the table input port, you see these icons. For the default column-major algorithm, the first input port, specifying the zero-based index to the table dimension that is one higher than the output dimensionality (0, 1, or 2). The next input specifies the zero-based index to the next table dimension, and so on. All index inputs must be real-valued. For the default column-major algorithm, the N-th input port, specifying the zero-based index to the table dimension that is N higher than the output dimensionality (0, 1, or 2). The number of inputs varies with the shape of the output. All index inputs must be real-valued. Table data, specified as a vector, matrix, or N-D array. The table size must match the dimensions of the Number of dimensions parameter. The block's output data type is the same as the table data type. To enable this port, select the Make table an input check box. Output slice, provided as a scalar, vector, or 2-D matrix. The size of the block output is determined by the setting of the Inputs select this object from table parameter. The output data type is the same as the table data type. Number of dimensions that the Table data parameter must have. This value determines the number of independent variables for the table and the number of inputs to the block. Select this check box to provide table data to the Direct Lookup Table (n-D) block as a block input. When you select this check box, a new input port, T, appears. Use this port to input the table data. Specify the table of output values. The table size must match the dimensions of the Number of table dimensions parameter. During block diagram editing, you can leave the Table data field empty. But for simulation, you must match the number of dimensions in Table data to the Number of table dimensions. For details on how to construct multidimensional MATLAB® arrays, see Multidimensional Arrays (MATLAB). Click Edit to open the Lookup Table Editor. For more information, see Edit Lookup Tables. To enable the Table data field, clear the Make table an input check box. Specify whether the output data is a single element, a vector, or a 2-D matrix. The number of input ports for indexing depends on your selection. This numbering matches MATLAB indexing. For example, if you have a 4-D table of data, follow these guidelines. Consider the row-major and column-major direct lookup algorithms with vector output from a 3-D table. The last dimension is the third dimension of a 3-D table. Due to semantic changes, column-major and row-major direct lookup may output different vector size and numerical values. This figure shows a Direct Lookup Table (n-D) block configured with a 3-D table and a vector output. When the model that contains this block is configured for column-major layout, the block icon shows the column-major algorithm. To have the same block use the row-major algorithm, change the Use algorithms optimized for row-major array layout configuration parameter of the model and recompile. The block icon changes to reflect the change to the algorithm optimized for row-major layout. 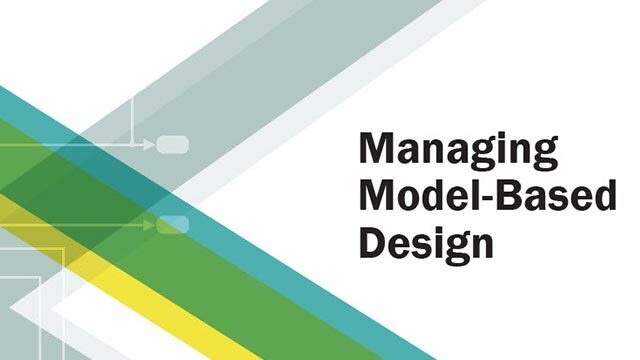 For more information on row-major support, see Row-Major Array Layout: Simplify integration with external C/C++ code for Lookup Table and other blocks (Simulink Coder). When you select None or Warning, the block clamps out-of-range indices to fit table dimensions. For example, if the specified index is 5.3 and the maximum index for that table dimension is 4, the block clamps the index to 4. The parameters in the Table Attributes pane are not available if you select Make table an input. In this case, the block inherits all table attributes from the input port with the label T.
Provide table data as an input to the Direct Lookup Table block. Specify table data on the dialog box of the Direct Lookup Table (n-D) block. [a] This block supports fixed-point data types for 'Table' data only. For more information about HDL code generation, see Direct Lookup Table (n-D). This block supports fixed-point data types for Table data only.